Pomegranates are rich with antioxidants, which help prevent cancer and speed healing. Combined with cherries and bananas, this smoothie is a delicious blast of nutrients. Blend all ingredients in blender until smooth and creamy. Serve at once. Serves 2. Yogurt cheese is made from plain yogurt and has the consistency of cream cheese. Use it as a spread for breads or as a base for dips. You may add herbs and spices, chopped vegetables or fruit to make a flavored cheese. Use the drained whey for soups or sauces. If adding herbs or flavors, stir into yogurt before beginning. Line a large strainer with a double layer of cheesecloth, three layers of paper towels or a coffee filter. Spoon yogurt into strainer and suspend the strainer over a bowl large enough so the drained liquid will not touch the strainer. Cover and refrigerate 24 hours to form yogurt cheese. One quart of yogurt yields about 2 cups of cheese. dessert – kids can make it too. Defrost berries before use. Layer ½ cup fruit, ¼ cup yogurt and 2 tbsp granola in a medium sized glass. Repeat layers. Serve at once. Serves 1. A hot variation of everyone’s favorite dip, this can be made ahead of time and refrigerated for several days. Coat a 1½ qt baking dish with cooking spray. Warm the olive oil in a small skillet; add chopped onions and sauté until soft. Combine onions and all remaining ingredients except Parmesan cheese in a bowl and mix well. Transfer mixture to the baking dish and sprinkle Parmesan cheese evenly over the top. Bake at 350 for 30 minutes or until browned and bubbly. Serve warm with crackers, chips or fresh vegetables. A summer favorite, dressed up with chocolate. Can be made with prepackaged graham cracker crust. Combine crumbs and sugar in a medium bowl; add butter and mix. Press mixture into a 9 inch pie plate until evenly distributed across bottom and sides. Cool in refrigerator. In a separate bowl, mix gelatin and boiling water until gelatin dissolves. Set aside. In another large bowl, beat cream cheese until fluffy; gradually add to gelatin mixture and refrigerate until partially set. Gently fold yogurt into partially set mixture and carefully fold filling into crust. Refrigerate until completely set. Add grated chocolate and serve. Serves 6. Yogurt is used frequently in Indian cooking. This classic dish is easy to prepare and can be spiced to your taste. Mix lime juice, ginger, garlic, chili powder, half of the cilantro, salt and pepper in a bowl and mix well. Add chicken and toss to coat. Cover and refrigerate overnight. Grill (or broil) the chicken breasts 10-15 minutes until cooked through. Meanwhile, heat oil in a sauté pan and cook the onion over medium-high heat, stirring frequently, until golden brown. Add turmeric and cook for one minute. Remove pan from heat and add La Yogurt a bit at a time, stirring constantly to keep from separating. Add remaining cilantro and chopped chili. Return to low heat, stirring constantly, until heated through. Add chicken to pan until hot throughout. Serve with basmati rice. 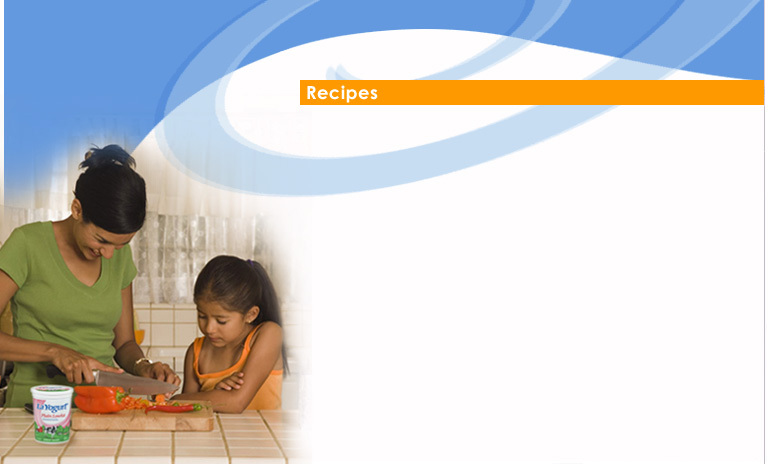 We have additional recipes! If you want to hear more about fun ways to use Johanna Foods products in your kitchen, please contact our Consumer Affairs representative at info@johannafoods.com or 800-727-6700 x420.